Im using a private domain email with outlook (IMAP) i was using office 2010 until today and no issues at all. All my IMAP folders works great with filters. Do you know what imap server software your mail host uses? they are using using IMAP 4. I'm having a variation on the same problem. Outlook 2010 worked great. Properly synced IMAP folders as did my iPhone so deletes and moves on one appeared on the other. 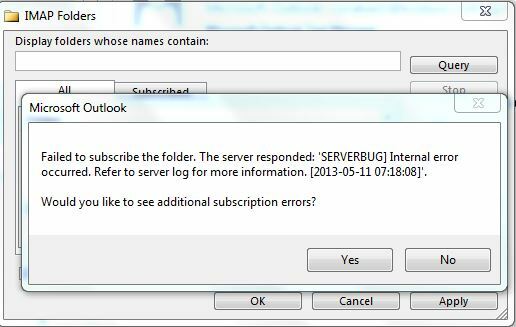 Then Outlook 2013 came out and the sync didn't work, mail I deleted in Outlook remained on the server despite purges. Tuesday an update to Outlook 2013 has removed the ability to sync to the Inbox folder but the subfolders are fine! So I have the reverse problem of the solution posted above. I can't see new mail in the inbox. I have to move email from the inbox on my iphone to a subfolder I created called Outlook and then Outlook will see it. Additionally, this doesn't happen with an AOL IMAP account but does with my own hosted and Gmail IMAP accounts. Has the mail shown up yet? Try resetting the view. The latest update fixed some imap issues but it needs to resync everything. For whatever reason some users can't see their mail in the inbox and resetting the view helps some of them.